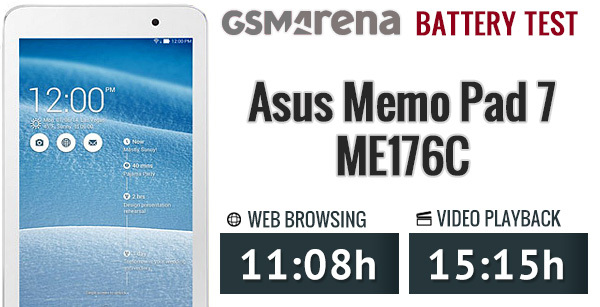 The Asus Memo Pad 7 ME176C is the lesser member of the new Memo Pad 7 lineup, and as such doesn't sport the 1920 x 1200px resolution found on the ME572C/L. Instead, you'll get a 1280 x 800px display which results in the rather insufficient 216ppi density. We ran our display test on the Memo Pad 7 where it achieved surprisingly good contrast for its class. Blacks were fairly deep at 50% brightness, and retained their low level at 100%. The whites' illumination was fairly low at both levels, however, but that still resulted in adequate contrast numbers. The Memo Pad 7 beat out the likes of the LG G Pad 8.3 and Google Nexus 7 in this department. Unfortunately, the great contrast ratio numbers were deeply marred by the highly reflective screen on the Memo Pad 7. At just below 1.2 sunlight contrast ratio, the screen of the Memo Pad 7 is virtually illegible outdoors even at maximum screen brightness, and also tends to smudge fairly easily. Mind you the high reflectivity concerns you even if you never take your tablet out - the contrast quickly degrades when any external light sources are present, so you won't get to enjoy the excellent contrast even in a moderately well-lit home or office. The Asus Memo Pad 7 has a 3,910mAh battery, which sounded like it should provide ample amounts of battery life thanks to the screen's low resolution. This was also our first chance to test how Intel's Atom Z-series processors perform under Android, and how they compare to their Qualcomm and Exynos counterparts. The Memo Pad 7 posted great scores in both browsing and video battery tests. Both scores are respectable - over 11 hours web browsing and 15 hours in video playback - and result in solid numbers compared to similarly-spec'd competition. 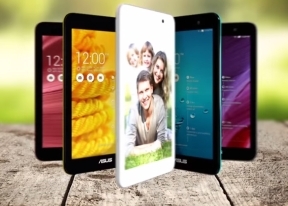 The Asus Memo Pad 7 ME176C is a Wi-Fi only device, with no cellular option to be found yet. Local connectivity includes a dual-band Wi-Fi b/g/n support as well as Wi-Fi Direct functionality. There's Bluetooth 4.0 and wireless display connectivity over the Miracast protocol. Another thing missing is a wired TV-Out option - a real shame given the capable chipset inside. There's a microUSB 2.0 port for charging and wired data connectivity and USB OTG support so you can mount external drives.